Bruce Davidson Featured on KPCC's "Off Ramp"
Added on November 13, 2014 by ROSEGALLERY. Huntington Exhibit: Who Captured Iconic Photos in England? Two Americans! An photo in England, taken by American Bruce Davidson. Off-Ramp commentator Marc Haefele reviews "Bruce Davidson/Paul Caponigro: Two American Photographers in Britain and Ireland," at the Huntington's MaryLou and George Boone Gallery through March 9, 2015. Paul Caponigro supposedly said, “I love people. I just don’t want them getting in front of my camera.” But his contemporary, Bruce Davidson, made his living photographing people. Both have an amazing new show at the Huntington. Bruce Davidson and Paul Caponigro, born in the 1930s, matured artistically in the 1950s and took different paths to photographic fame. Davidson became a high-end magazine photographer, working with authors such as Norman Mailer, with whom he did a famous series on Brooklyn street gangs. Caponigro took a more creative path, falling under the artistic influence of Ansel Adams, Edward Weston and Minor White. He used a big view camera with a tripod, while Davidson used Leicas. Both knew each other’s work, but neither met until this show at the Huntington was compiled. You could accurately oversimplify their work’s differences by saying that Davidson is a people photographer, while Caponigro does places. Both by coincidence ended up in the British Isles in the 1960s. And for both, that experience changed their artistic visions. Much of the work they did there has never been shown until now. Caponigro’s original overseas destination had been Egypt, but 1960 anti-American turmoil there detoured him first to Ireland and then England. Clearly he found in the remote regions of both places the mystic experience he had earlier sought along the Nile. He said, “There’s a force in this land which is alive.” His work there, which he continued into the 1990s, often focuses on the prehistoric world of dolmens, standing stones, and their surrounding landscapes. Paul Caponigro (b. 1932), Stonehenge, 1967, gelatin silver print. © Paul Caponigro, photo courtesy of The Huntington Library, Art Collections, and Botanical Gardens. Until 1977, when it was fenced in by officials, he practically lived at Stonehenge, which he photographed from many angles, in different lights, in varying seasons, in unimagined aspects. Perhaps no photographer has ever been this close to this ancient monument, and his stunning black and white portraits as shown here are definitive. But then, so are his landscapes and pictures of wildlife — and ever so rarely, even people. But people were Davidson’s thing. 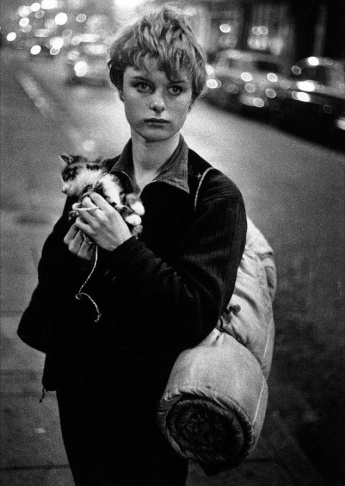 His famous shot of a street waif with a sleeping bag over one shoulder holding a kitten was an iconic image in England. Yale exhibit curator Scott Wilcox notes that Davidson arrived in Britain with little knowledge of the place, commissioned by a fancy British magazine to do an American's eye view of the island. “He had the privilege being allowed on the inside,” said Wilcox. It was the first of his three camera-toting trips. Bruce Davidson (b. 1933), London, 1960, gelatin silver print. © Bruce Davidson/Magnum Photos, photo courtesy of The Huntington Library, Art Collections, and Botanical Gardens. Davidson first concentrated on London street scenes, including pub goers, street musicians, crowds and panhandlers. Then he moved out of London to resort towns, where he snapped couples sitting outside getting what sunshine they could, and then it was onward to Yorkshire and Scotland. Next he went to the U.S. to photograph the Civil Rights struggle and returned, to Britain, a changed man, to photograph the downtrodden miners of Wales in a style that evokes Walker Evans. In 1967, he went to Ireland to do a pictorial study of an Irish family circus. The result is an inspired career capstone of photographic virtuosity that is also lively and charged with delight. Still Looking (excerpt) from IN MOTION | The Huntington on Vimeo. Behind the exhibit gallery, they're screening a short film by the Huntington's Kate Lain that shows the photographers as they appear today. Both men look as though their work has kept them young.